A key challenge for strategic elements is the concentration of many of the world's largest deposits and reserve bases in a small number of countries. As the global economy grows more dependent on individual nations for mineral supplies, political, environmental, or economic problems within these producing nations could quickly and negatively influence world strategic mineral prices. For example, price hikes, export regulations, and trade embargos can limit the availability and affordability of strategic minerals to resource-dependent consumers. The market risks of limited access are evident in price changes. When dominant producer nations decide to restrict strategic mineral access, demand from developed consumer nations is not met, and prices rise unsustainably. Countries with highly developed industry may be able to adapt to high element prices, but countries that aspire to be developed could be left out. To address this problem, it is important to analyze how producer countries come to play a dominant role in the strategic element world market. In the simplest of cases, the country is fortuitous enough to have large mineral reserves and becomes a dominant producer simply by supplying the mineral to other countries whose supplies are limited (e.g. South Africa possesses over 80% of platinum group elements reserves in the world (2011)). In other cases, producer nations can out-compete other countries with preferential government trade laws with give their products a price advantage. The problem of limited access to strategic minerals is exemplified by one of the world's strategic minerals leaders: China's rare earth elements (REEs). China is already the world's dominant producer nation for energy critical REEs, as well as several technology critical elements. China's current control of the REE mineral market serves as a proper case study for identifying the causes and effects of limited access caused by a single dominant world producer. The issue of limited access of strategic minerals is most urgent for REEs. This group of elements is absolutely critical for the development of alternative energy technologies, but China has an imbalanced degree of control over the global market. Globally, there is concern about China in regards to strategic elements. Although China is largely an importer of other industrial rare metals, China is by far the world's largest supplier of REEs. Due to its complete control of its own mining supply chains, the Chinese government has the ability to greatly influence the availability and affordability of REEs to the rest of the world. According to current production numbers China's control over rare earth elements is near-monopolistic. China is responsible for between 95 and 97% of the world's rare earth production and possesses 89% of the world's rare earth reserve base (Morrison, 2012;Tse, 2011). The United States imports as much as 91% of its REEs from China (Humphries, 2012). Japan and the European Union import almost all of their rare earths from China (European Trade Commission, 2012). Japan and the United States make up the largest portion of China's rare earth consumers. Table 1: Shown are the amounts (metric tons and % of global share) of REE production and reserves for major producing countries (Humphries, 2012). Figure 1: Pictured is the amount of U.S. Imports of Rare Earths (metric tons) from 2002 and 2011. Total Rare Earths imported are pictured in blue; the Chinese fraction is pictured in red (Morrison et al., 2011). Figure 2: Pictured are Chinese export locations in 2011 as percentage of total exports. Country names are labeled next to individual colored slices on the pie chart, along with the corresponding export percentage (Morrison et al., 2011). Although the United States could never rely on countries like Japan and Germany for the production of rare earths the United States' dependence on China is a relatively recent development. Due to the region's unique geology, China had previously contained many large REE, platinum group elements (PGEs), rare metals (RMs), and phosphorus deposits for private and governmental mining companies to explore. Rich rare earth deposits in the Fujian, Guangdong, Jiangxi, and Sichuan regions were highly appealing to private companies, and Chinese mining began to play a major role in the world market during the mid-1980s, (Morrison et al., 2011). In the late '90s, the Chinese government allowed these companies to produce REEs with little to no regulation, which allowed China to effectively out-compete nearly all western REE mining operations. At the height of China's production peak during this time, its REEs sold for 5.50 USD per kilogram on average, a historic low. Mining was so cost effective that REEs were actually in surplus until the Chinese government took hold of domestic production in the early 2000s. By this time, China had overtaken the United States as the top producer of REEs. Mining and advanced processing is also centralized in China. China is among the few countries with the infrastructure to mine and process rare earths consistently. Due to the low cost of production, the Chinese government is often able to attract foreign processing firms inside China's borders. Once these companies associate with state-owned joint ventures, China's control of rare earths extends higher on the supply chain beyond raw production (Morrison et al., 2011). 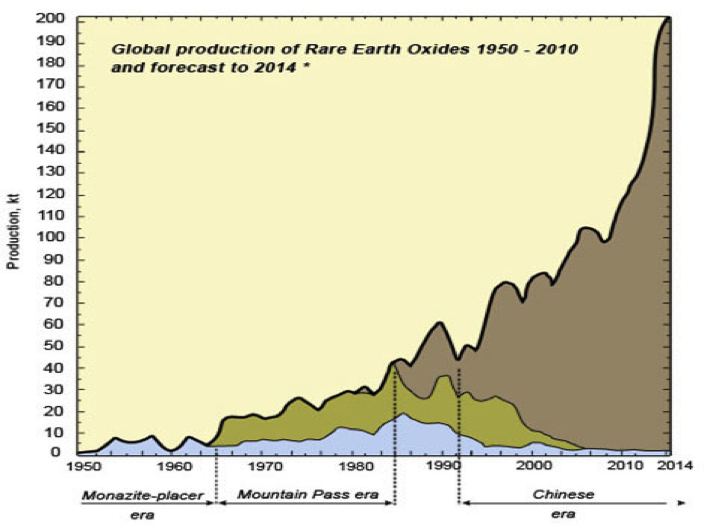 Figure 3: Pictured is the total global production of REEs in the form of Rare Earth Oxides (REOs) in kt. China is pictured in green, the production from Mountain Pass Mine, CA is pictured in Red, and other countries are pictured in yellow. Adapted From: "Rare Earth Elements-Critical Resources for High Technology", United States Geological Survey, 2005. Figure 4: Planned expansion of Chinese REE mining districts. 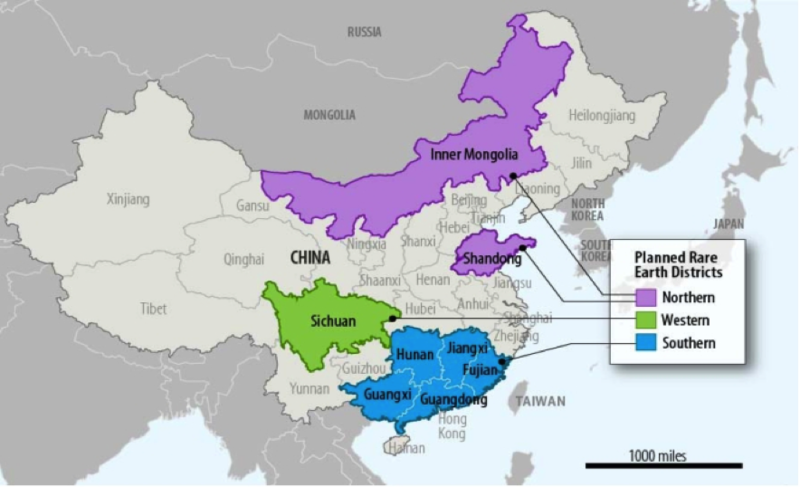 Most of these regions, especially in the southern region, currently contribute to the majority of Chinese Rare Earth Exports (Morrison et al., 2011). Chinese mining supply chains are almost entirely state-owned. The government took control of all domestic supply processes in the 2000s in order to compete with international REE suppliers; even foreign investors are barred from mining within China unless these companies work with state-controlled joint ventures (Tse, 2009). All domestic mining is taxed by the Chinese government to limit mine production (Tse, 2011). China's "Guidelines to Promote Sustainable and Sound Development of the Rare Earth Industry" Act labeled rare earths as a protected, strategic resource, which allowed the government to take total control of the mining industry. Over recent years, China has been steadily decreasing its exports to rare earth importing nations, because of newly-instated production quotas by China's Ministry of Land and Resources. Each year, these quotas have become increasingly stringent; over the past 7 years, China has halved these REE export quotas (Morrison, 2012). Nevertheless, Chinese REE production sometimes exceeds state quotas, particularly during 2006 and 2009, because of the action of unregulated mining and smuggling. The Chinese government has continued to shut down unregulated mining within its borders and currently projects that it will maintain its rare earth oxide export quotas at 35 metric kt per year in the future (Tse, 2009). Table 2: Chinese Rare Earth Export Quotas from 2005 to 2012, divided between domestic producers and joint venture producers. Total export quotas are shown in bold below. Adapted From: "China"s Rare Earth Industry and Export Regime: Economic and Trade Implications for the United States' by Morrison, Wayne M. and Tang, R, 2011, Congressional Research Service. Chinese export prices for rare earth oxides (REOs) in 2011 show China's immense preferential treatment toward internal trade, as export prices are more than 68% higher than Chinese domestic prices (see Table 3). China's export duties on Rare earths have increased from 10% in 2007 to as high as 25% in 2012. Table 3: Chinese rare earth oxide domestic and export prices in 2011. A selection of rare earth oxides are used as case studies to illustrate price differences between internal Chinese trade and global distribution. The difference between domestic and export prices is taken as a positive percentage difference and labeled in the third column (Morrison et al., 2011). The Chinese government has enforced regulations in domestic supply chains and global REE commerce due in part to China's new environmental regulations, but mostly to its rapidly growing demand. Despite its huge production, China is set to become one of the world's biggest rare earth importers. Estimates show that a decade ago, China contributed to about only 30% of the world's REE demand; today China is responsible for as much as 70%. This number is only projected to increase in the future, as industrial China continues to invest further in alternative energy and green technologies (Roskill Estimates, 2012). China has stated that it aims to become a world leader in innovation and technology with its "National Medium-and Long-Term Program for Science and Technology Development" plan (Morrison et al., 2011). This objective explains the Chinese government's need to enforce restrictions on their REE exports. China's drive to become advanced and independent drives its internal demand higher each year; it could become a net importer as soon as 2014, depending on how its adopts renewable energy technologies, among other advanced REE-dependent innovations (Reuters, 2012). 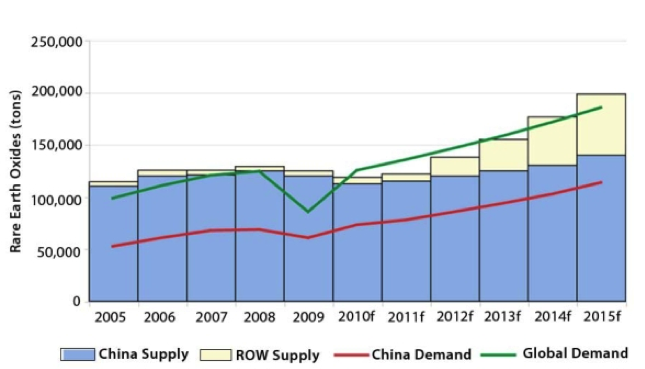 Figure 5: Global supply of rare earth oxides in China and in the rest of the world (ROW) (bar graphs) and Chinese and Global demand (curves). The Chinese government's newfound effort to protect the environment is another cause of their slump in REE exports. During China's rise to dominance over global REE production, many of these private mining companies flooded the markets with little regard for the environment. The impact of this highly opportunistic mining in mineral-rich locations endangered the health of mine workers and nearby civilians. Even non-mineral exports from China were affected by toxic mining byproducts; Chinese quality inspection agencies discovered that up to 22% of tea products produced by Lipton Tea's supplier Unilever contained residual amounts of toxic rare earth chemicals (3.4 mg/kg, instead of 2.0 mg/kg). These chemicals do accumulate in the human body with continued intake and are likely to cause negative health effects (China Daily, 2011). Chinese media regularly exposed similar incidents to the Chinese public as well as the world, tainting the country's image on the global stage. As a result, China has focused on combating illicit mining practices by enforcing tighter environmental standards and trade regulations. The Ministry of Environmental Protection enforced a mandate for all mining companies to observe specific emission standards on the threat of termination (Tse, 2011), in compliance to its 2009 goal to reduce industrial emissions. Since then China's overall REE exports have slumped significantly. Current REE production levels are largely due to China's past and existing policies. China's rise dominance of the market is the result of a history of low production cost; the countries of the rest of the world allowed themselves to become dependent on a centralized exporter. Now that China aims to control its strategic resources, preserve environment, and develop its technology by decreasing its exports, it will remain at the center of the global spotlight, especially when it comes to international trade. Tse, P.-K., 2009, The mineral industry of China [advance release] in Area reports—International: U.S.
Humphries, M. (2012). Rare earth elements: The global supply chain. (CRS Report). United States of America: Congressional Research Service. Morrison, W. M., & Tang, R. (2011). China's rare earth industry and export regime: Economic and trade implications for the united states. (CRS Report).Congressional Research Service. Moss, R. L., Tzimas, E., Kara, H., Willis, P., & and Kooroshy, J. (2011). Critical metals in strategic energy technologies: Assessing rare metals as supply-chain bottlenecks in low-carbon energy technologies. (JRC Publication No. EUR 24884 EN). Luxembourg: Publications Office of the European Union. Tse, P. (2011). China's rare-earth industry. (Open–File Report No. 1042). Reston, Virginia: U.S. Department of the Interior.